Hi friends! I’m so excited to share with you this new collaboration I did with Christina, the girl behind Sunshine Tulip Design! 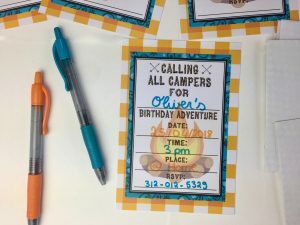 I’ve already talked about her before in THIS post but she makes the cutest printables for all kinds of celebrations from birthdays to graduations… I find printables a great starting point for a party. 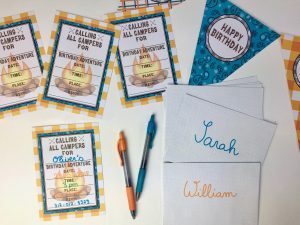 If you’re stuck for ideas, printables are always a good way to get you started. Plus, its super affordable and you can just get them from the comfort of your own home! 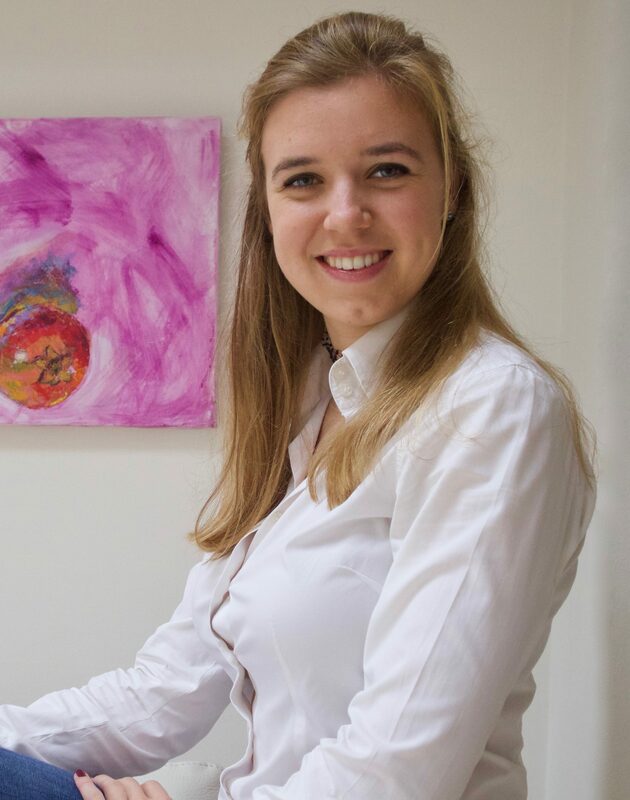 You can check out her Etsy shop here! Ok, now lets really jump into this party!! 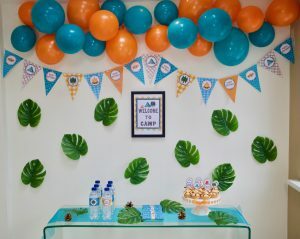 So the printables dictated the colour theme of course… so orange and turquoise! I find this such an unusual colour combo but I kind of love it!! 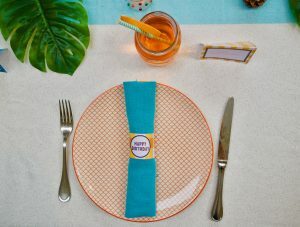 Oh by the way, you can shop the printables for this specific theme HERE. 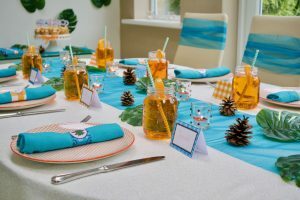 But as you’ve probably noticed by now, I love to create a fun background and side table decoration as well as an actual table decor. I went kind of all out on the back wall decoration so kept the centerpiece quite low and simple. Side note, you’ll see I did something similar in THIS post – one of my favourites! 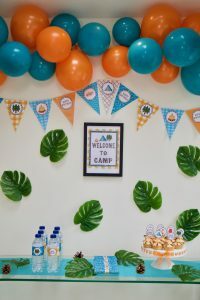 I just looove making balloon garlands, I think they look amazing and they’re so easy to make so this is what I’ve done for this decor again! If you haven’t tried making one yet and need a few tips and tricks, I’m showing you how I’m making it in the video I’ll be posting soon! 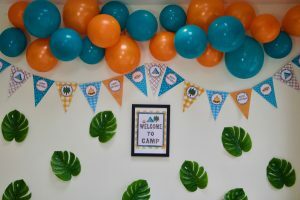 I also love this little framed sign that says “Welcome to Camp”! 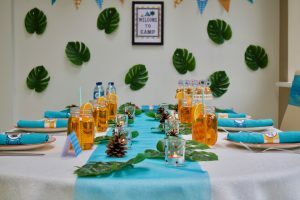 It really sets the mood for this party, paired with these fun palm leaves (that you might recognise from this post… hehe). This little sign is part of the printables package, don’t you worry! 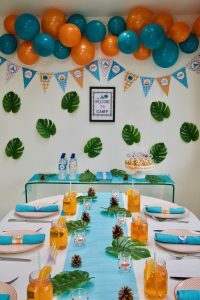 Oh and I loooove the party banner that I also made from the printables! Its so cute, don’t you think? 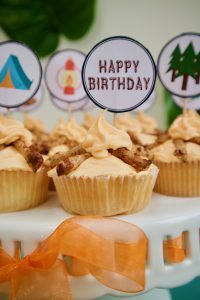 Other than that, I made this fun pit fire cupcakes – which I’ll also be showing you in the video! 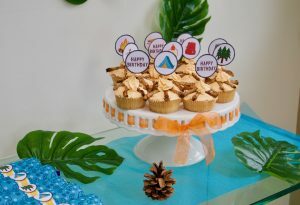 The cupcake toppers are also part of the printables and I find they add the perfect touch! Ok, now the party pack also includes these Hershey bar wrappers… but Hershey bars don’t exist in the UK so I got some milk chocolate Cadbury bars instead and they’re a little smaller than the Hershey bars so they make look a little weird to some of you! But they still are a cute touch I find! 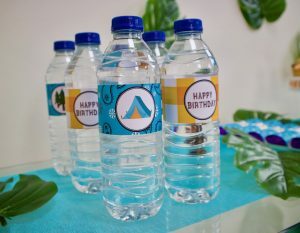 Lastly, I made these water bottles! Well, I didn’t MAKE them obviously but I added the labels! I know they’re a super popular trend but its actually my first time making these! They’re so fun! Moving onto the actual table decor. Now, I’m well aware its for a kids birthday party so I wanted to keep things a little more relaxed than I usually do. Nevertheless, I couldn’t resist getting these orange plates for the occasion! I mean, how perfect are they for this theme!? 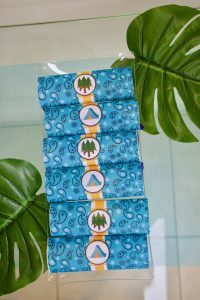 Fun fact about these napkins… I had actually purchased turquoise napkins but they ended up not being the right shade at all so I went into my reserves and found these leftover pieces of turquoise fabric so decided they’d be my napkins! After all, a napkin is only a piece of fabric, am I right?! Oh and these napkins rings are actually extra labels for the water bottles that I just cut shorter. I thought it was pretty ingenious! I used tent cards as name tags for each kid so they feel a little more special. 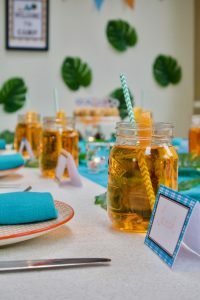 I also used my trusty mason jars in which I poured orange cordial – which gives it this really bright orange colour. I also got these fun turquoise straws. 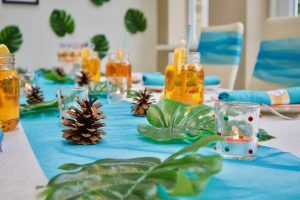 Other than that, I kept the rest of the decor minimal sticking to the pine cones and palm leaves theme. I also added candles – orange candles to be precise. You know me! No decor is complete without candles! 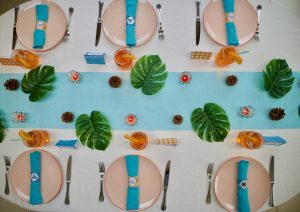 Oh and I added a long piece of turquoise organza as a sort of table runner… which you’ll see I also used on the chairs! Ok, I think that’s it! I’ll share more in the video so stay tuned! 😉 Oh, I almost forgot to mention the invitations… because of course one needs invitations to give to one’s guests! Well, Sunshine Tulip Design has got you covered! Because she also includes cute invitations in her party package! They are so in the theme! They are perfect to get your little guests in the mood even before the party starts!! Ok… so because I haven’t said it enough times, keep your eyes peeled for the video!! 😉 What do you think of this theme? 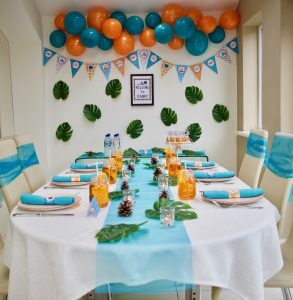 Would you go for that for your next party? I would love to hear your reactions! 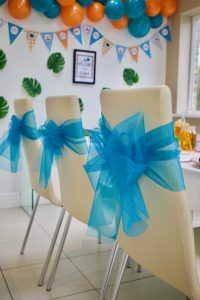 I love the bows on the chairs. I hope you put the tuto on YouTube! 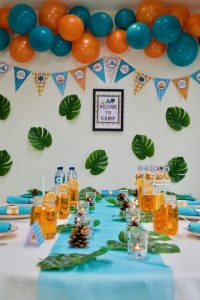 The cutest party!! 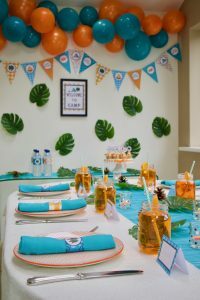 I love the colors, the theme, and of course the cute printables!! You guys make a great party pair!! Such fun inspiration my friend! !